Camp Runamuck: That Just Won't Do! Deciding on a maiden warp is serious business. 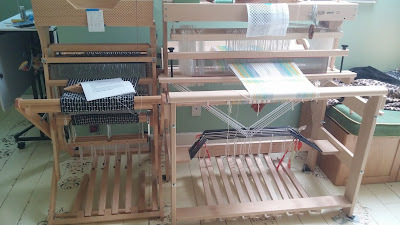 It needs to be simple enough that you can get to know your new loom and complicated enough to see the possibilities for future warps. I'm telling you right now, you probably shouldn't grab a pre-made warp meant for a test run on a structure, which is what I did to David. I can also tell you honeycomb may never touch another loom at my house. The structure did not allow me to enjoy my new loom at all so after a mere 10 inches I cut the whole thing off and rethreaded and sleyed for a fun variation on M's & O's. We are both very happy campers now. The David is a capable weaving loom, quiet, easy to thread and tie up, great shed and a sliding beater. The beater was a bugger to get adjusted well. Just a smidgen off and it works but feels sticky. Once you have it though it is very nice to use. 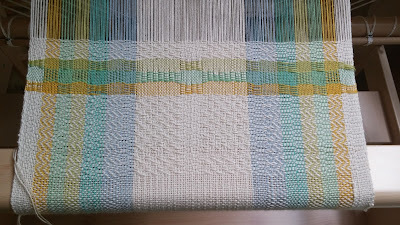 So post honeycomb, I am loving my new little loom and I think this warp will be awfully pretty as runners and placemats! Thank you each and everyone for your comments on Mandy, she is so coming out of her shell, starting to really hang with the gang and giving us much joy! OMG, watching dachshunds run is quite entertaining! To anyone thinking of adopting, don't let age distract you from need. 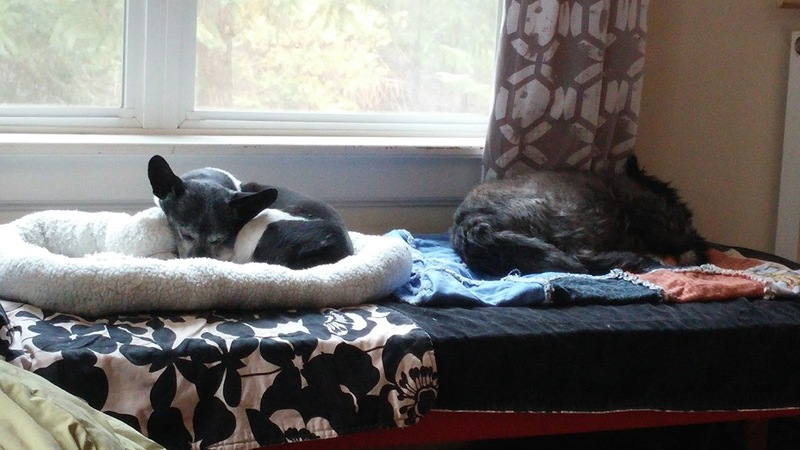 Mandy is about 8 and lively and sweet and with just enough terrier type personality to fit in with our rambunctious household. She is eating regular dog food and dog biscuits now. House trained too! 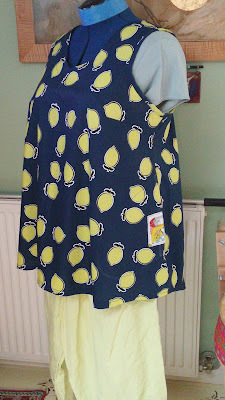 Precious little has come out of the sewing salon. Today I need to do some cutting for fall. I did finish up this last Webster. 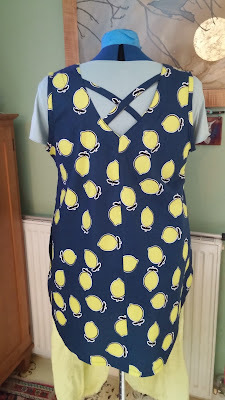 Could be a favorite for fall. 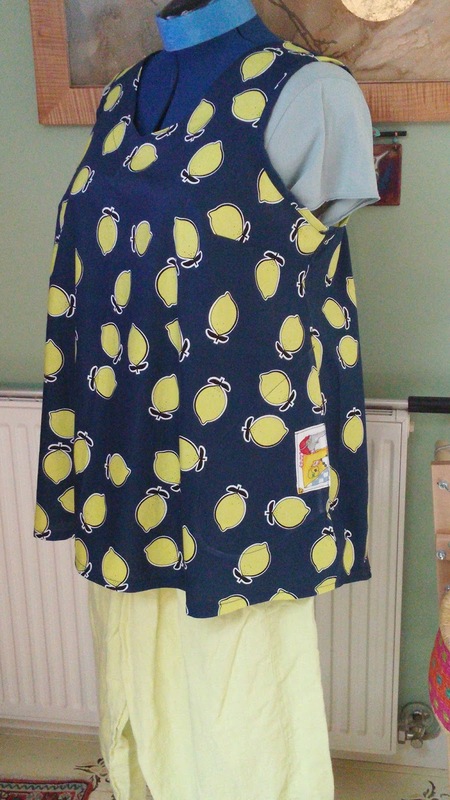 It looks pretty sweet with a navy cardigan and a pair of slim jeans too! I did find myself in downtown Ashland Thursday. 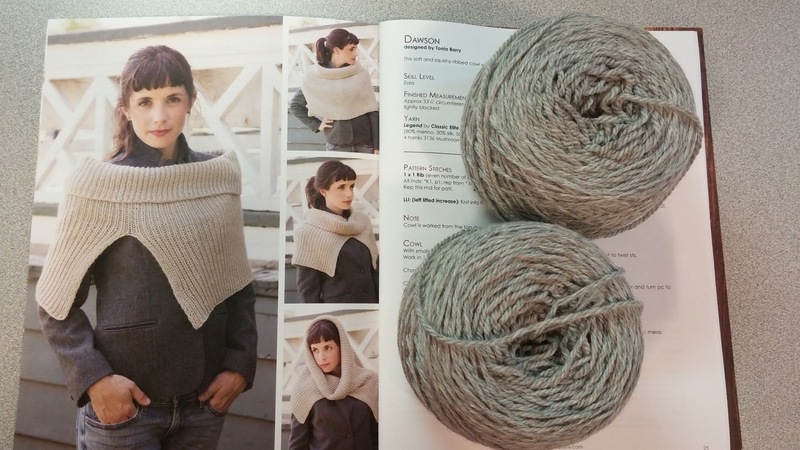 The Web-sters sends out little newsletters weekly featuring new yarns or patterns. It's an evil thing I tell you. 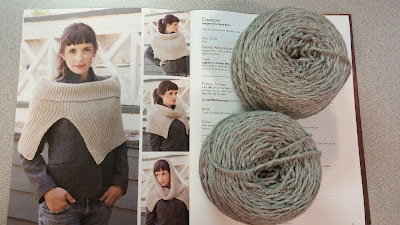 ;-) One shawl caught my eye and made it onto the must have list. I wasn't particularly thrilled with the yarn used so went rogue and purchased some of my favorite Shepherd's Wool Yarn for the project. A nice value too. I'm about 4 inches into the project. Good simple knitting on bigger needles. My kind of project these days. After the horrible clear cut next door our wildlife all but disappeared, but this late summer, Momma Raccoon has got another batch of 3 kits and just as cute and fractious as last years nursery. I've spied a fox a few occasions and some of the bird population has returned to our little neck of the woods. The hummers have been active and plentiful this summer after a slow start. The deer have been almost nonexistent. Their numbers appear to way down. It has been awfully smokey though, enough to make my eyes water and my throat feel scratchy. I have not ridden at all this summer but the boys are experienced pasture pets and go with the flow. Parting shots: Pensive and not so much so. I'm glad your new loom is up and running. If you get a chance, I'd love to see a close up of the beater. It looks to me like the warp rides rather high in the reed. Mandy looks like she is adjusting very nicely to Camp Runamuck! Aww! Mandy is awfully cute. 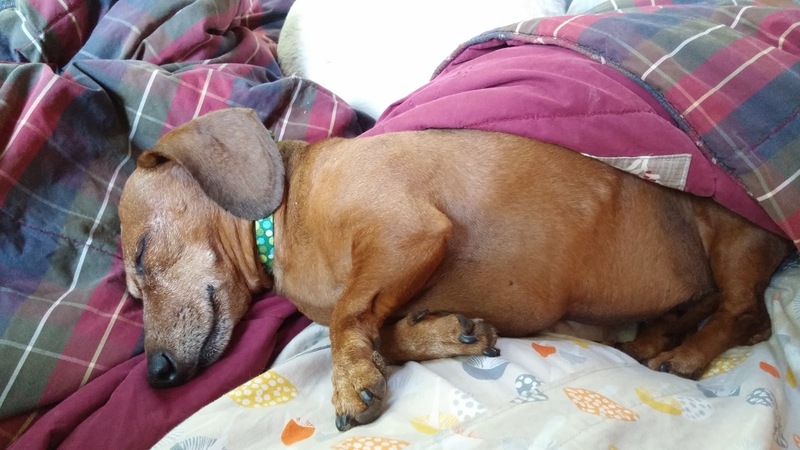 My mom rescued a long-haired dachshund. 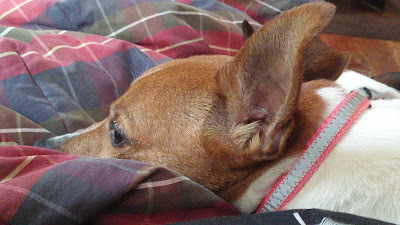 She is an opinionated little stink, and one of the first things she did was disappear for 45 minutes down the rabbit hole under the woodpile. Scared mom half to death, then out she came, dirty and quite pleased. She has to go out attended or on a leash now as she is an escape artist as well. Probably why she needed rescuing. Mandy looks like she's fitting in nicely. My heart goes out to all the fire victims on the west coast and now to those effected by Harvey. It scares me to think what would we do with all our pets if we had to move fast from fire or flooding water. I can imagine you are thrilled with the new loom. Love the little doggie. I'd take a daschund for sure if one happened by. After MUCH internal debate I recently firmly decided NOT to get a cat, and I wouldn't get a dog that would want or need to go on my big walks with me as I think that would be too hurtful to Jack, but I do think a friend would be a good thing. So glad that Mandy has fit right in! I think your wildlife will filter back - they are so resilient. They have to be. Susan, They certainly do. She is getting more vocal and initiating play, all good signs of adjustment. Peg, I worry about back issues with doxies, but I have to say, she is a winsome little girl. Susan M-M, I am loving the new David, so quiet and easy to work on. Oh god, the flooding, the fires, and going forward if we don't do something now, it is only going to get worse. Leigh, They have just enough terrier in them to give you heart failure. In all my years of loving dogs the only one who ever bit me was a doxie named Beauregard, the evil little devil! LA, You;ve got the pics. It is a curious set up but seems to work just fine. 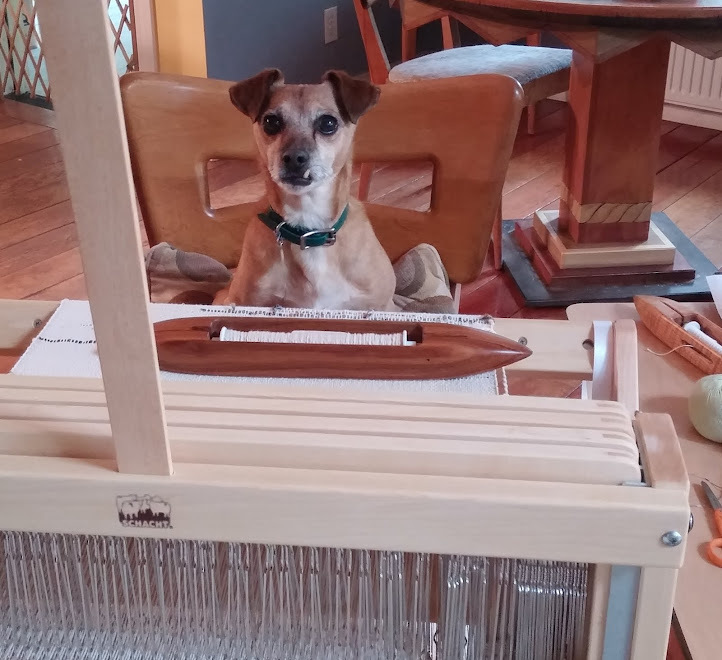 I'm glad to hear you're working it out with your new loom. It's so interesting how they all have their own personalities and preferences. I love the navy and yellow in your Webster top. Great color combo! Camp Runamuck continues, much as usual...:-) This is a GOOD thing. 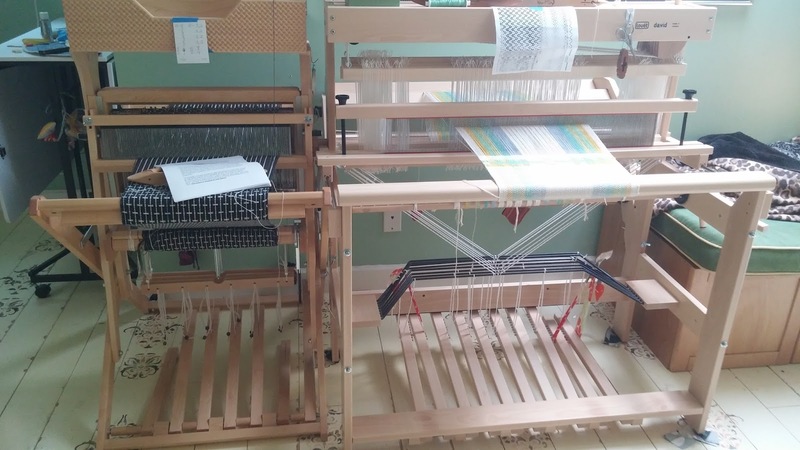 Nice to meet Mandy and your new loom. I'm not a fan of honeycomb and don't understand the attraction. Glad I'm not the only one. Your Ms&Os is much better! Thanks for listing the charities. I had been meaning to look up Save the Children.